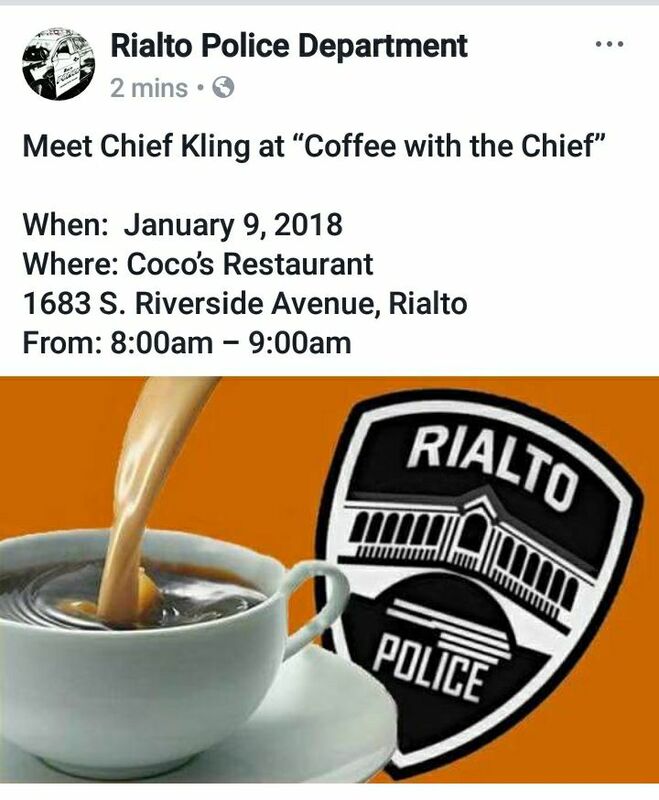 Last time there was supposed to be a Coffee with the Chief event it was canceled and notice was not widely put out as many complained that they drove all over looking for it. It was not odd to have the event canceled as Chief Deanda was entering retirement and an interm police chief was getting settled. Yet will residents give Chief Kling a fair shake? Well he should be able to slip right into the role he created over 10 years ago. Yes Interm Police Chief is the former Chief of Police before Tony Fararr and was the architect of programs in Rialto like Coffee with the Chief, Community Policing and Area Command Meetings. Chief Kling was also the one to bring in collaboration with code enforcement and beefing up parking enforcement. New residents are in for a treat as Chief Kling always seemed to enjoy the interactions he had with the community at these meetings. Now the community gets to see if a decade away from sitting in the seat as chief has changed him any. Come on out to this meeting this will be one you don’t want to miss. Rialto is in a very critical point in our cities existence and many may be looking to the incoming development as a saving windfall. We are here to tell you that this isn’t the case Rialto is in a tough spot and its going to take everyone doing their jobs to get us through it. The reason we say everyone doing their jobs is right now some staff and the community are the only ones stepping up to the plate and if the rest of the players don’t figure that out, own their bad and get on board with getting things back on track it is going to spell disaster. The Community – This group of people have been doing a lion share of the heavy lifting. Most people believe they have no recourse and they must accept bad leadership and money mismanagement. This is not the case even though we may be on a certain leaders team it never hurts to remind those leaders we support we can no longer give them blanket support for a laundry list of bad calls. You can see how the city council is fracturing as they all split off to their specific groups and ask for help with dealing with the others. When it comes to the Utility Users Tax the community can’t support TAX AND SPEND Liberals in such high majorities when voting and then look at a tax that actually provides us services we all say we want to keep as a bad thing. The City Council – I have never been a fan of forming a consensus I believe it leads to to many back room deals and excludes the community at large as a few key power groups ideology reigns supreme. Yet on this issue I see it as juvenile to allow the whole city to suffer just to make a political point. I say this because the issue of declaring a financial emergency still hangs in the balance and is holding up Rialto’s ability to see where we are going over the next 10 years. City Council is playing political chicken with our future, information that has come from staff says that City Council is having an issue declaring a state of emergency because we still have a healthy surplus. A surplus that will only afford Rialto a 6 month time frame of stability if the worse was ever to happen. It seems like City Council wants us to be broke and defaulting on loans before we do anything to right our unstable future. I don’t know anyone that would look at their personal or business finances and see a real financial avalanche heading their way and not do anything within reason to stop what seems to be inevitable. One of City Councils epic failures was the 3% at 50 PERS offering. According to sources to help with employee retention Councilman Ed Scott brought this in. Now this program is no longer offered to new employees but employees already in this program have it no matter what. The Mayor – Mayor Robertson has done a very good job of pushing the blame for failures onto other people or pretending that things are better than they really are. Mayor Robertson is the biggest holdout when it comes to declaring a state of financial emergency in this city and this isn’t the 1st time she has pulled this stunt. Four years ago she pulled the same stunt as she threw a tantrum and asked public safety to make massive concessions like no longer being able to cash out comp, sick, holiday or vacation time, $300 cut in uniform allowance and no raise. Now she is taking things a step further as now Mayor Robertson wants to once again ask Public Safety to forgo a raise, loose all special assignment pay and take everyone back one full step in pay. Remember this is the same Mayor that wanted to give herself a massive raise for a very part time job. Staff – Staff plays a big role in what is going on here since they seem incapable of giving the Council, Mayor and Community a true and honest look at the consequences of staff recommended actions. Many times staff have fallen on the sword for the Mayor and City Council to shield them from the consequences of their actions. Yes staff works hard and puts in long hours but when they keep the truth from the community or shield the electeds from the consequences of their actions they sully all the hard work they have put in. 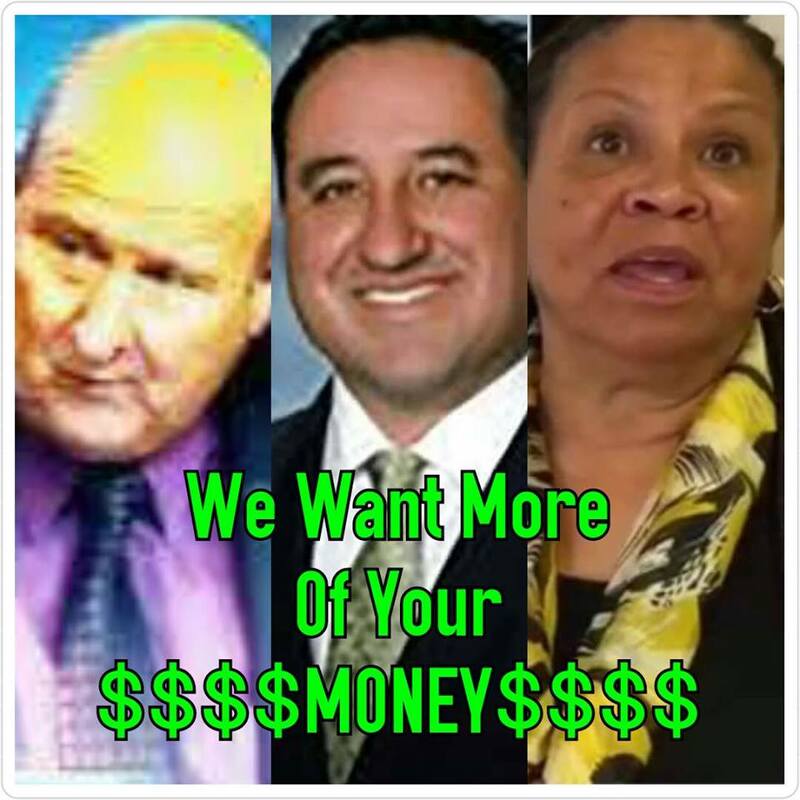 City Attorney – Some day we will have a city attorney that doesn’t rip us off (Jimmy Gutierrez) and we will have one that has the testicle fortitude to stand in the gap and advocate for the community rather than cover up for the Council and Mayor. In one case the city has spent $720,000 already in defending the city in a legal case that could have been fixed had someone stopped everyone’s egos. Also the City Attorney needs to remind the Mayor that giving away buildings to friends and political allies is a slippery slope to gifting of public funds. We are not saying this is the case but a property on Riverside Ave in Downtown seems to have changed ownership without any other public consideration and it has a lot of people scratching their heads.